Here are some facts about Giuseppe Arcimboldo. Giuseppe Arcimboldo was born in Milan, Italy in 1526 or 1527. His father was an artist. When he was in his early twenties, Giuseppe Arcimboldo designed stained glass and painted frescoes. In 1562, Arcimboldo was made the portraitist to Ferdinand I. He served at the Habsburg Court in Vienna. He later fulfilled the same role for Maximillian II and Rudolf II in the court in Prague. 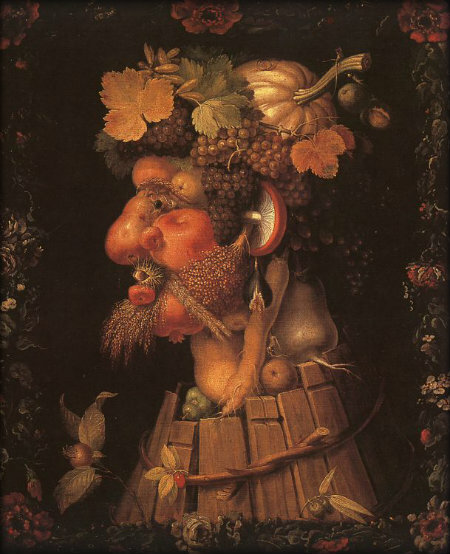 During his life, Giuseppe Arcimboldo produced many works of art on religious subjects, but he is most well known for his portraits of people made up of fruit, vegetables and other objects from nature. From a distance, these portraits look like regular portraits of human beings, but up close it is obvious that they are constructed from cleverly painted objects. The paintings are as much still life as they are portraits. Giuseppe Arcimboldo died on 11th July 1593 in Milan. Many of Giuseppe Arcimboldo’s paintings were taken from the Rudolf II collection in 1648, when Sweden invaded Prague during the Thirty Years’ War. Today his work can be seen in several different museums and galleries, including: the Louvre in Paris, Uffizi Gallery in Florence and the Denver Art Museum in Denver, Colorado. The work of Giuseppe Arcimboldo influenced the work of the surrealist painters, such as Salvador Dali. What next? Discover some facts about other famous artists.